Griffin & Howe .300 H&H Magnum bull gun, Ben Comfort, 1935 Camp Perry Wimbledon Cup, engraved, inspired by Elmer Keith - Sportsman's Legacy, Fine firearms, related books and sporting collectibles. Representing estates, collectors and nonprofit conservation organizations. Griffin & Howe .300 H&H Magnum single shot bull gun, engraved “Ben C. Comfort” with his 1935 Wimbledon Cup-winning score. Built on Remington 30-S Express action serial number 23063 (made in 1932 per Remington), Griffin & Howe rifle number 1415 was “likely” (per G&H Archivist) completed in 1935. (Repeated attempts to locate any G&H records for this rifle were unsuccessful). 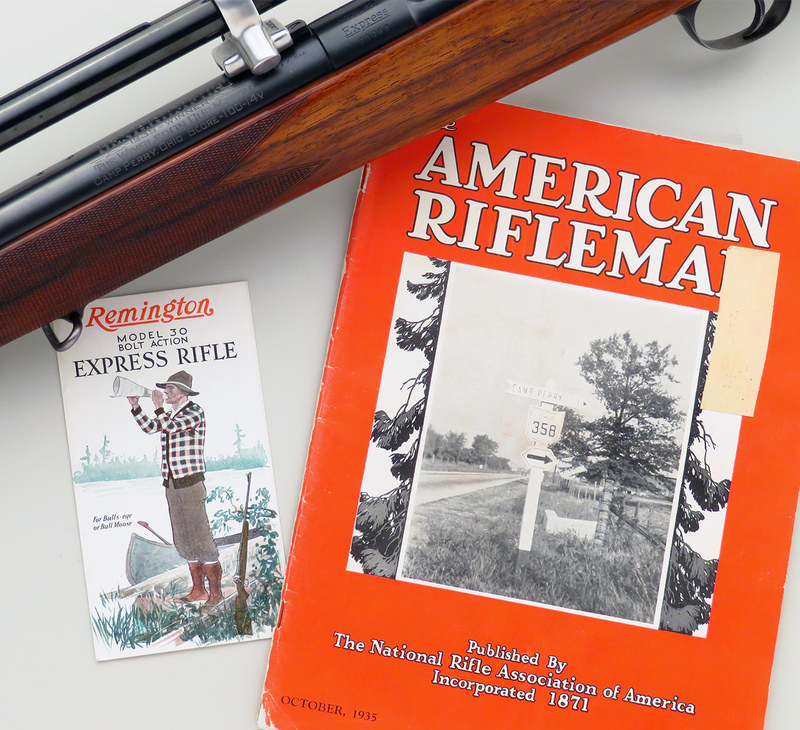 According to the chapter “Ben Comfort’s Sighters” from the book “The National Matches – 1903-2003, The First 100 Years” published by the NRA’s Competitive Shooting Division (NRA is the sponsor of Camp Perry’s Wimbledon Cup), Comfort had “…only just received his custom-built rifle. He had no sighting data for 1,000 yards…“, this passage supporting the G&H Archivist’s assertion that the rifle was made/shipped in 1935. 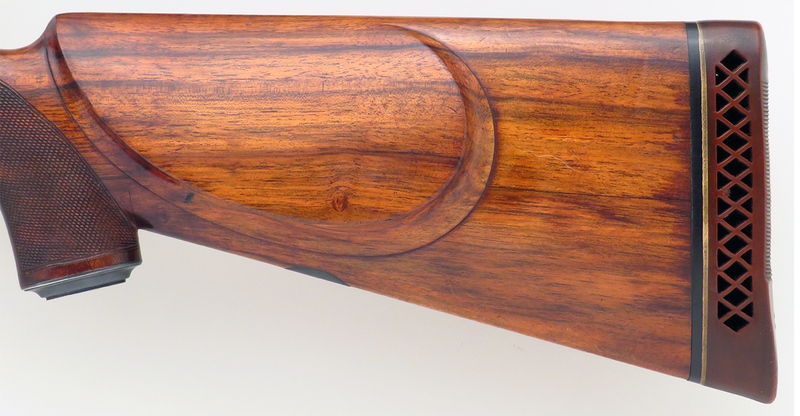 This same chapter states that Griffin & Howe indeed built Comfort’s rifle on a 1917 action (the Remington 30-S being visually similar to a 1917 without the rear sight “ears”), and that it was stocked by G&H’s Ernest Kerner. Also, the chapter cites a 1936 G&H ad that the barrel was 30-inches long and tapers from a diameter of 1.3 inches at the receiver to 1.0 inch at the muzzle. 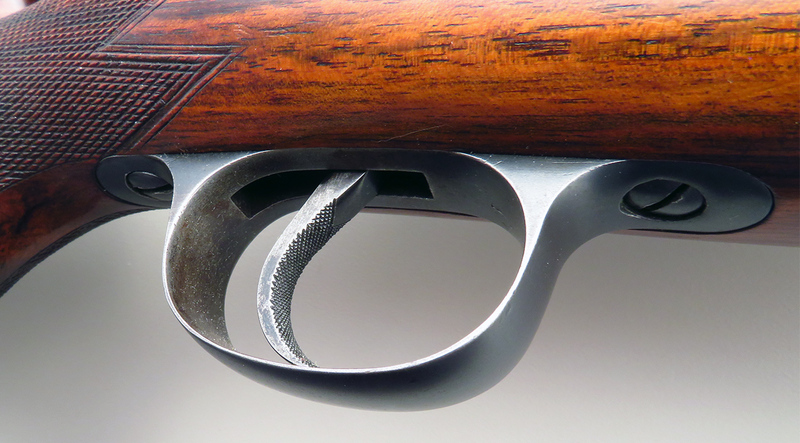 The barrel of this rifle is, indeed, 30 inches long and measures 1.241 inches at the receiver and .941 inch at the muzzle – the slight difference a likely result of finishing. 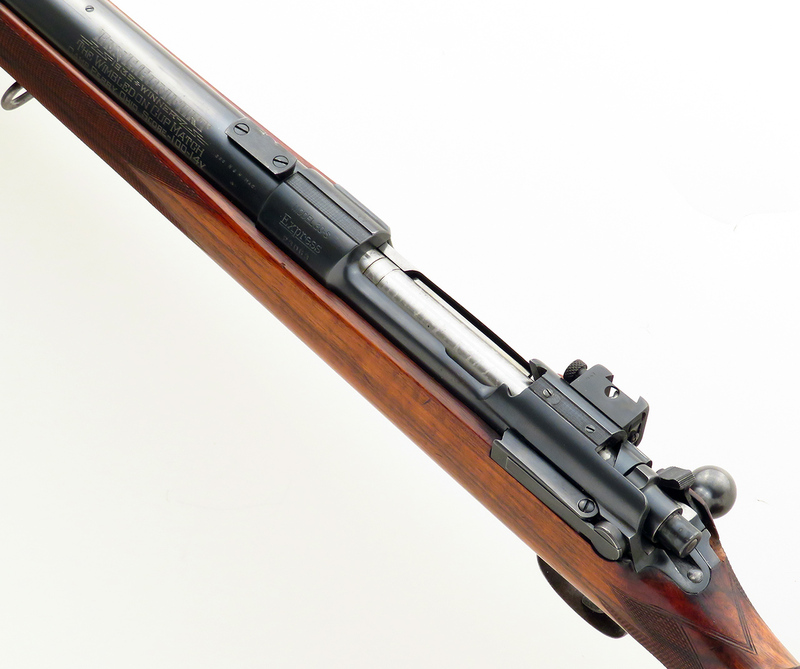 It also reports that Comfort’s rifle was a single shot, as is the subject (the magazine box is plugged with a carefully-fitted walnut insert). A Griffin & Howe ad appearing in the November, 1935 issue of American Rifleman reads “Camp Perry Wimbledon Cup won this year by Ben C. Comfort with a Griffin & Howe .300 Magnum rifle”. Another G&H ad from the September, 1936 issue states that the rifle was stocked by their own Ernest Kerner. A search by the NRA failed to turn up any specific reference to Comfort’s rifle by serial number. Unfortunately, the records kept of competition rifle trigger pull weights were not retained. In Keith, An Autobiography, Elmer Keith writes “In 1933 I booked Ben Comfort and Vic Asby from St. Louis for a month’s sheep, goat and deer hunt in the Big Horn Craig’s.” After relating some happenings of the hunt, Keith remembered “While Vic and Gerry were off on a side hunt down Roaring Creek, we got a three-day blizzard. While Ben and I were waiting it out, he asked me what it would take to win the Wimbledon cup. 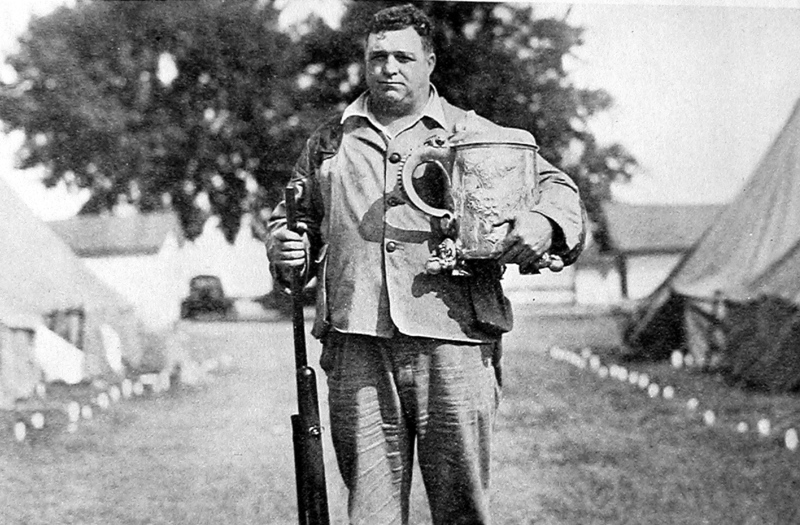 I told him the best cartridge I knew would be the .300 Magnum bull gun, and he had Griffin & Howe build it…The next year at Camp Perry he won the great Wimbledon cup and sent me a picture of himself drinking beer out of it. He was a big, fat man and I surely enjoyed the picture of him drinking beer out of that huge Wimbledon cup. After that, it was a long time before the cup was won with anything but the .300 Magnum.” Finally, Elmer related that he “...saw the finest mule deer of his entire life on that trip…“, and that Comfort missed it three times at 400 yards. He had even offered Comfort $100 for the opportunity to take the shot, but Ben turned him down. Elsewhere, Keith recalls his response to Comfort’s questioning about the ideal rifle Wimbledon Cup rifle, “…a .300 Magnum bull gun with a 30-inch barrel, prone stock…“, then “...Ben had Griffin & Howe make it up, and the shooting world knows what he did with it…“. MARKINGS: “No. 1415 Griffin & Howe Inc. New York” is centered on the barrel. 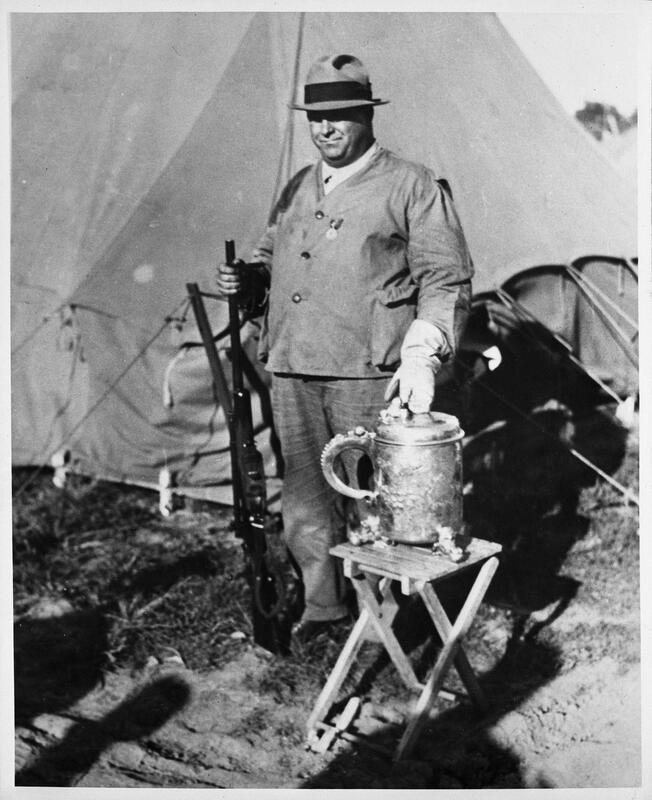 “Ben C. Comfort, 1935 Winner, The Wimbledon Cup Match, Camp Perry. Ohio. 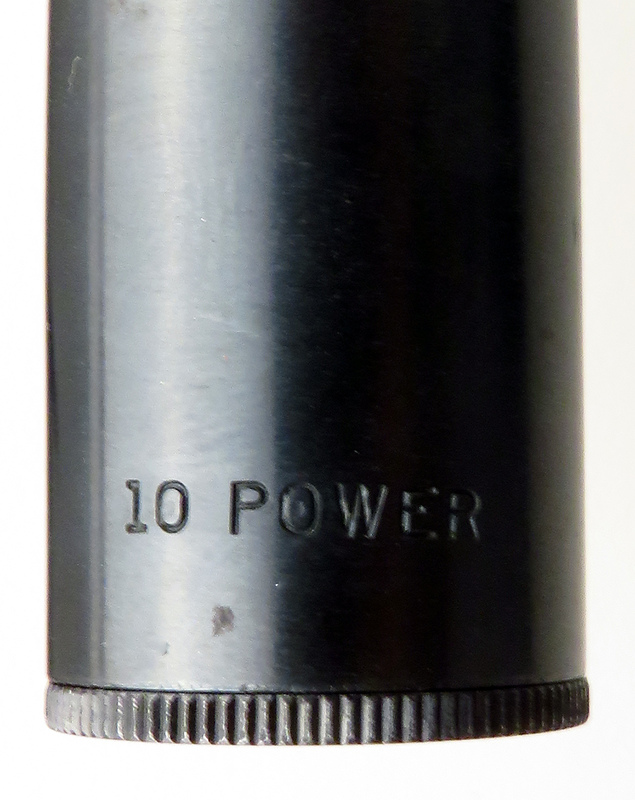 Score-100-14V” appears on the left side of the barrel near the front ring. “659” is written in pencil three times along the barrel channel. FEATURES: Bolt body, extractor and rail are jeweled, cheekpiece with shadow line, metal pistol grip cap, blank oval in toe line, inletted base with loop for shooting sling. DIMENSIONS: Weight (sans scope) is 13.2 pounds. Length-of-pull is 13.6 inches. SCOPE: Lyman 10x Super Targetspot number 6439 with straight “cross hair” reticle and threaded metal lens caps. Lenses are nearly pristine and optical quality is without issue. CONDITION: The bore is strong and bright, with sharp rifling. Rust blue is about 95 percent overall, with evidence of open sights (absent). The rear bridge has been drilled and tapped (two holes) and has a filled third hole. The Lyman base is missing its sight. Wood is about 85 percent, with a very good finish and a number of modest field and handling impressions. The stock has what appears to be an original splice to the rear of the pistol grip, adding a bit more wood so as to give it more depth. (Checkering and finish over this area appear to be original). 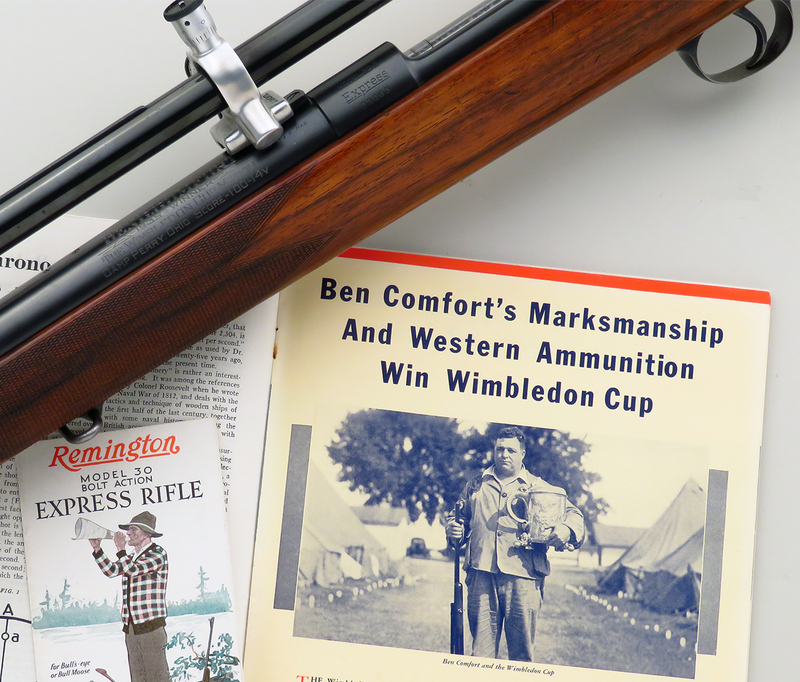 INCLUSIONS: American Rifleman, October, 1935, photocopies of Ben Comfort’s Sighters, Elmer Keith book pages and a host of articles on Comfort, the Wimbledon Cup and the influence of Comfort’s win on the long-range shooting and hunting world. RESEARCH NOTES: It is occasionally reported that Comfort had G&H build a pair of rifles for his effort. 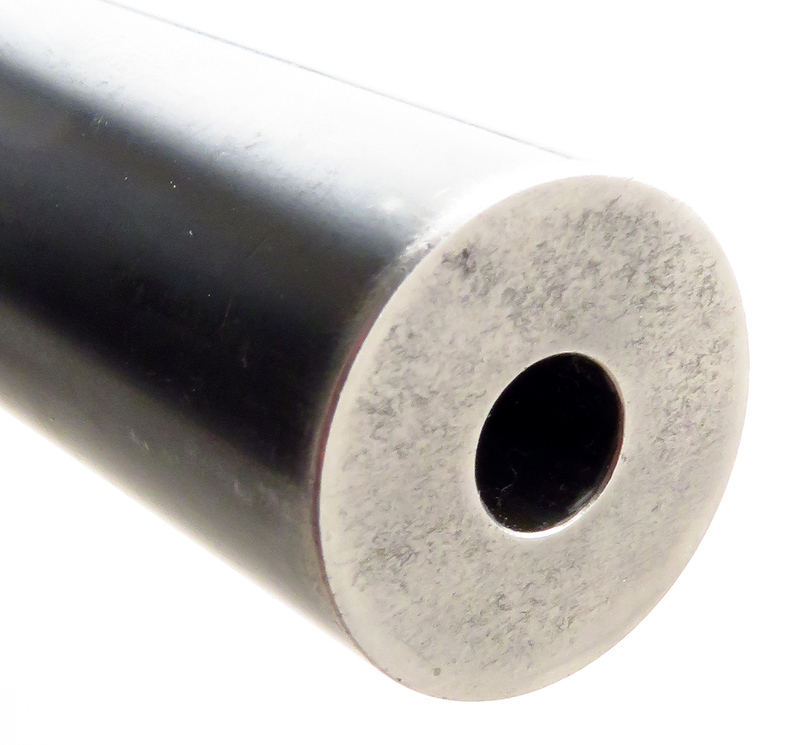 It seems all but certain that the current scope on the rifle is not the one pictured (and certainly not the one generally described) as what Comfort used on his competition rifle.